If you have a problem with insects, you can cover the Garden Commander with fine screening or cloth and keep insects at bay. Garden Commander protects the rows of your garden, come in 4 foot lengths, is perfect for raised-bed gardens, and can be overlapped to cover very long rows. On each end, the row is closed with an end cap creating a closed, protected environment where your plants can safely develop isolated from destructive deer, rabbits, and other pests that could endanger them. Garden Commander is available in three sizes which are very easy to move, allowing you to replace them with larger ones as your plants grow. Just move the smaller ones to your younger plants as needed. Garden Commander, when compared to other methods of protecting your garden, is very economical. Building a fence to keep deer out of your garden is very expensive because you must purchase gates, posts, and the fence material plus the cost and time it takes to put it up. And, by the way, you’d better make that fence 8 feet tall if you want to keep out deer. Those fences will also make great perches for hungry birds that will love eating your strawberries or other produce before you do! Or, you could use some terrible smelling deer repellant that will have to be replaced every time it rains. Better get a LOT of that stuff, whatever it is, and it’s not cheap. Hopefully it isn’t full of chemicals that will end up in your soil. Garden Commander sections are easy to store after the growing season. Each one fits inside the other. They are made of tough steel and will be working for you for many years. They are so easy to move your grandmother could do it. It’s truly the best way to protect your garden from Deer and other animals. If you have any questions call us today at (540) 454-3671. Take back your garden, don't let deer and other wildlife get your produce before you do! Perfect for raised bed gardens and larger row gardens too. Perfect for raised beds, square foot gardens & garden rows! Low profile attractive in appearance, never need unsightly fencing again. Constructed of high quality 14 gauge galvanized wire. No rust & will last MANY years. Proven deer repellent that also keeps out groundhogs, rabbits, birds, squirrels & more. Stops wildlife from eating your garden. Cost effective! No expensive fencing needed. Small initial investment. Environmentally friendly – chemical repellents no longer needed, safe for pets & wildlife too! Cover Garden Commander with plastic to create a “mini greenhouse”, perfect for early spring start-ups & extend the growing season. 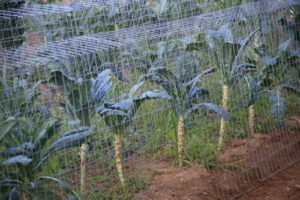 Frost frame – When frost threatens, cover Garden Commander frame with frost cloth, fabric or plastic to protect your flowers, vegetables or herbs. Protection from insects – Cover with a fine net to protect your plants from destructive insects. An ideal choice for tall plant supports such as iris, peonies, gladiolas, lilies & more! Unique design - no need to stake down! Easily moved for weeding & harvesting plants. Available in two sizes -26 or 29 inches height – both in popular 4-foot lengths and 2-foot widths. Clips easily to custom fit your garden footprint. Matching end caps sold in pairs. Organic – sustainable – chemical free gardens are easily achieved with Garden Commander! Avoid using toxic deer repellent and unsightly deer fencing. Why install tall, unsightly fences to stop those hungry deer? Garden Commander is the safe, cost-effective way to protect your plants from deer, rabbits, squirrels, birds, and more! You'll never use toxic chemicals or deer repellents that wash away in the rain again. 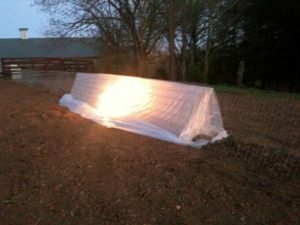 Frustrated by unsuccessful attempts to keep deer out of our own garden using various other solutions on the market, we created the perfect deer repellent – a cage cover system that we call the Garden Commander. 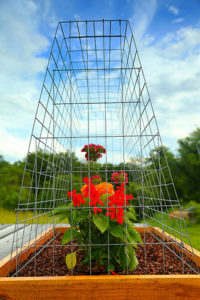 Our easy to use garden row covers made from galvanized wire will last for years. This natural solution protects gardens without expensive and unsightly deer fencing. It provides the perfect organic pest control without using costly, earth damaging pesticides. Although the Garden Commander was originally designed to protect your garden from deer, it also repels small animals including rabbits, squirrels, birds, groundhogs and more. the PERFECT ALTERNATIVE to expensive fencing and harsh chemicals. So, go ahead and grow your vegetable and flower gardens without worrying about deer and other animals eating your vegetables or plants. This is hands-down the simplest way to achieve a "worry-free" sustainable garden. It's so light my grandmother can pick it up with one finger, yet so strong it doesn't need stakes and it won't tip over. Just cover it over your garden row, or raised bed, and it's installed! This great new green product is safe for the environment and allows you to grow organic gardens naturally. Of the many thousand Garden Commanders we have sold, not one has ever been returned. We think that is amazing! Read our reviews. 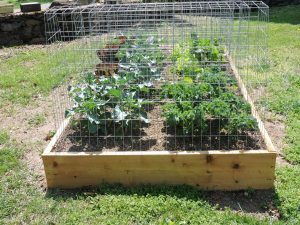 for garden rows, raised beds and square foot gardening!